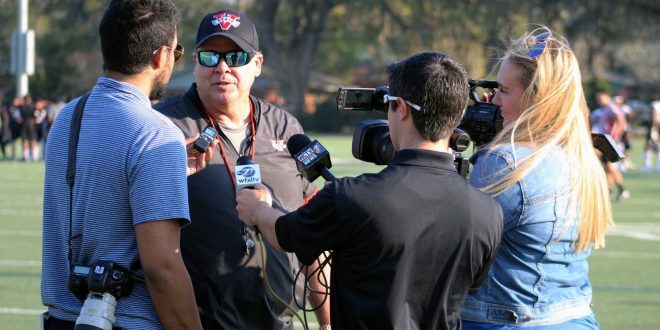 After three years as head coach of VSU Football Kerwin Bell is headed to the University of South Florida to take over as offensive coordinator. After a three year stint as head coach of Valdosta State Football, Kerwin Bell is moving on. Reports that Bell met with University of South Florida coach Charlie Strong began last week and it will be announced that Bell is joining the program soon. The decision to leave VSU comes on the heels of Bell’s first national championship with the Blazers in December. The Blazers are the favorite to repeat as the Division II national champions but they’ll have to do so without offensive line coach Jeremy Darveau and defensive coordinator Danny Verpaele also. It was announced that Darveau would be joining Bell at USF while Verpaele, a USF alum, will reportedly be headed to Kennesaw State to join their defensive coaching staff. In the time that Bell had the reins of the Blazers he amassed a 27-7 overall record, including four playoff wins and two wins over rival West Georgia. In his final season Bell led the Blazers to the first undefeated season, fourth national championship and seventh conference championship in program history. The Blazers were the highest scoring offense in the nation led by Harlon Hill finalist Rogan Wells. Wells was the conference Offensive Player of the Year and his backfield mate Jamar Thompkins was the conference Offensive Freshmen of the Year. It is expected that the search for a new head coach and staff will be announced by VSU Athletics soon. Story and photo by Juston Lewis, Editor-in-chief.